Supercrawl 2011 is going to be so damn good. I’m crying inside that I’m going to miss it. Instead of artcrawling, I’ll be heading to beautiful upstate NY for the 4th out of 5 weddings of the season. It will be fun but it might be hard pressed to top the 3 major free festivals that will all be running simultaneously in Hamilton’s downtown core on Saturday, September 10th. We’ve got the Locke Street Festival, Country Music Week (at Copps Coliseum & on top of Jackson Square) and the SUPERCRAWL on James St. north. J Mascis of Dinosaur Junior -9:15pm Stage 1 at York & James N.
Basia Bulat will be playing with the Hamilton Philharmonic Orchestra -7pm Stage 1 at York & James N.
Black Francis aka Frank Black of The Pixies and Reid Paley -9pm Stage 2 Colborne & James N. (Paley & Francis will be releasing their new album with Hamilton local record label Sonic Unyon). Junior Boys back from their world tour, and home to Hamilton for the Supercrawl! -9pm Stage 2 Colborne & James N.
Hamilton’s own, Young Rival -4:15pm Stage 1 at York & James N.
DMC Canadian Final DJ Competition at Academia Banquet Hall (upper floor), 242 James St. north. I would also love to see the hand knitted art installation that will replicate the entire brick facade of The Brain, done by the Beehive Craft Collective. This is going to be so cool! Oh, and how could I forget to mention a super exhibit called Women’s Work that will be on display at Project Space 126/128 James St. north, opening reception on the Supercrawl night from 7-10pm. It will be an exhibit of fantastic crafty, textileness, which will include a beehive paper dress by artist Hitoko Okata. The day before the Supercrawl; Friday September 9th will be Terra Lighfoot‘s CD release party at This Ain’t Hollywood, and James St. north will still be kickin’ with it’s regular monthly art crawl from 7-11pm. The Supercrawl will take place on Saturday, September 10th from 10am-12 midnight, from York/Wilson and James St. north all the way down to This Ain’t Hollywood. 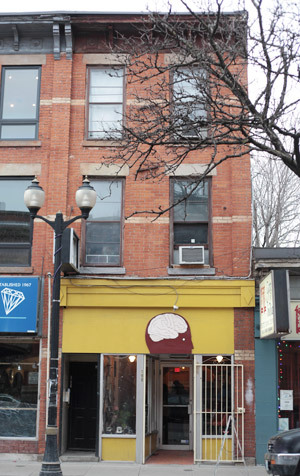 After parties a plenty at The Brain -199 James St. north (dance party to soul, house, disco boogie) free, 1pm-2am, and after party thrown by Beauty Industries at The Red Mill Theatre -80 James St. north (at Wilson) $10 to get in, 9pm-2am. On top of a phenomenal line up of class act musical artists both local and otherwise there will be some amazing visual artists and art installations, plus galleries and the ever increasing number of independent and cool shops, will all be open and pumping at full throttle. Here is a list of the 2011 Supercrawl contingent. For specific times and locations of performances look here. FYI Free shuttle buses available from the Locke St. festival to the Supercrawl. Last Wednesday night we headed to This Ain’t Hollywood to see PS I Love You. A duo hailing from Kingston, Ontario, they’re signed to Paper Bag Records and have been getting major acclaim from all your indie type music sources such as; Pitchfork, as well as some noted recognition for their Polaris Music Prize nomination. Their debut album Meet Me at the Muster Station was listed in Exclaim! for Top Pop & Rock Albums of 2010. I came across this video a little while back, and loved the gritty lo-fi sound, and catchy guitar hooks. So when I got wind that they were coming to town I was happy to be able to see yet another fantastic live musical act making a stop in Hamilton. I can barely manage to keep a beat and breath at the same time. Meanwhile Paul Saulnier can rip it up on the guitar like something furious, wail and play the foot-pedal bass organ like a pro all the while keeping pace with the quick and steady licks of drummer Benjamin Nelson. For more PS I Love You Videos you can check out Southern Souls acoustic sets of Starfield, Little Spoon, Butterflies and Boners, and Facelove here. AND if you want to see PS I Love you they’ll be doing another show October 3rd at This Ain’t Hollywood. An honourable mention goes out to Hamilton’s The Mystics for their mad tambourine playing, and for taking us back to the days of rough edgy rock with their opening set.